This is what is called short track racing. It was a real ball to watch. 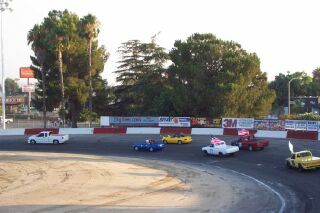 The first few races were only 4 to 6 laps and only a few cars out on the track.. BUT.. later when they got 20 or more cars for 20 or more laps it got interesting. 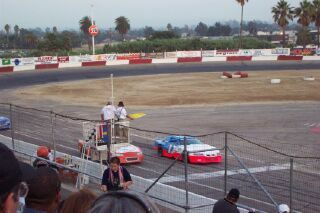 They even have NASCAR V8 stock cars on this little track. Seems like a lot of muscle and car for a short track. But.. the crowd seems to like it. These were my favorite.. they are called Legends... 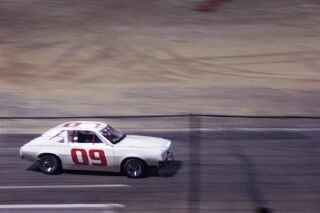 They fashion a body out of sheet metal to look like an old legend car. The engine is a 750 cc Motorcycle engine. Man.. these babies fly and they hold the track real well. Road Rage.. well, we saw one guy doing a little rubbing on another car and he finally spun him out to get him out of the way on the last lap. Well, after the guy who spun out got it under control he came racing up and rammed the guy who spun him out. Then they had to push both cars off the track. 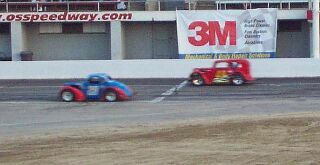 In one race they had 26 cars on this short track. 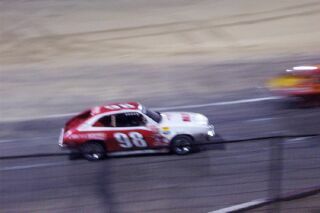 This guy was leading after about 22 laps but there was another car trying to pass. He finally got by him and a yellow flag came out. This meant they had to go back a lap and the guy was behind again. This happened to this guy 2 more times for a total of three times. He would pass and somebody would wreck making it yellow and he would be behind again. He finally did pass and win and it was great racing to watch him do it. Some of the drivers were pretty talented.